I got the coolest thing in the mail yesterday. My sweet mummy and daddy sent me a set of stationery. Not just any stationery, Parisian stationery. 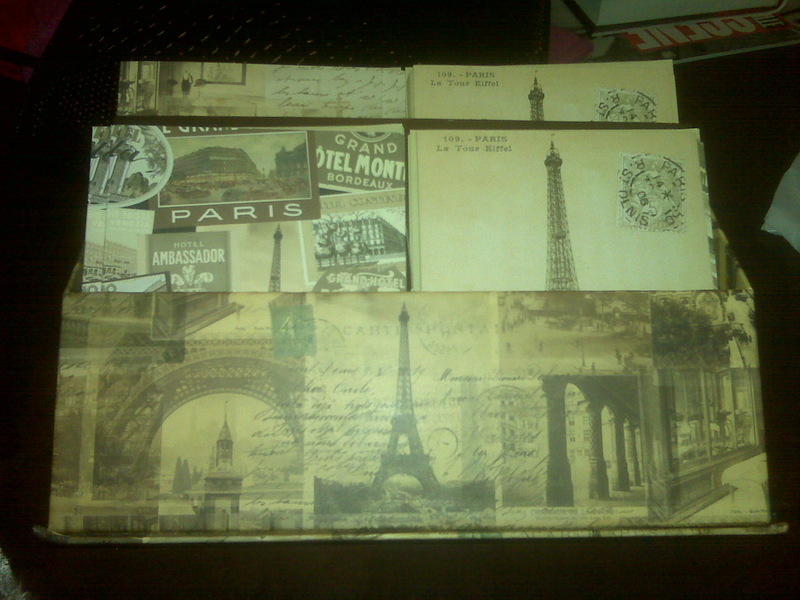 Not from Paris, but with Paris “stuff” on it. Sheesh, why I gotta explain myself so much to you guys? Anywho, it was the coolest. I was also thrilled to get a sweet card and two honest-to-goodness letters from my brother and his fiance in the mail a couple of days ago. I love those kids. A letter is the perfect gift. I mean, what takes more thought and consideration than to sit down with an actual pen and paper and compose sentences, written conversation with a specific individual in mind? It doesn’t get any more personal I don’t think. I mean, you’ve got to lick the envelope and everything. I used to write real live letters all the time on real live paper. I wrote everyone, my bff, my parents, boyfriends, everyone. Not so much anymore now that email and the internet have taken over. I should make an effort to write more letters. New Year’s Resolution #327. Y’all have a nice day and go write a letter or somethin’.